How Might Autism & Diabetes Be Related? Back in 2012, researchers associated with the M.I.N.D. Institute in California reported a study in which significant links were found between a “Metabolic Syndrome” in mothers and the occurrence of autism in their children. While the media played it up largely as links between autism and diabetes, this Metabolic Syndrome includes a spectrum of related symptoms which can also include hypertension during pregnancy, obesity, fertility problems especially related to conditions such as Polycystic Ovarian Syndrome (PCOS), milder diabetic conditions like insulin resistance, hirsutism, adult acne, hypothyroidism, and increased risk for ovarian and uterine cancers. In the above study, however, inclusion criteria were limited to diabetes, hypertension, and obesity which the researchers said were the strongest predictors of this Metabolic Syndrome. The group concluded that hormonal abnormalities may occur more frequently in autism families and may play a role, via testosterone, in the etiology of autism. Why the links between this Metabolic Syndrome and autism? I can’t profess to know for sure, however I do have a hypothesis as to how this kind of Metabolic Syndrome could produce the type of neuroanatomy that my partner has found to be a common underlying theme to autism . There is overwhelming evidence that proliferation of the neocortex during embryogenesis is abnormal in autism. 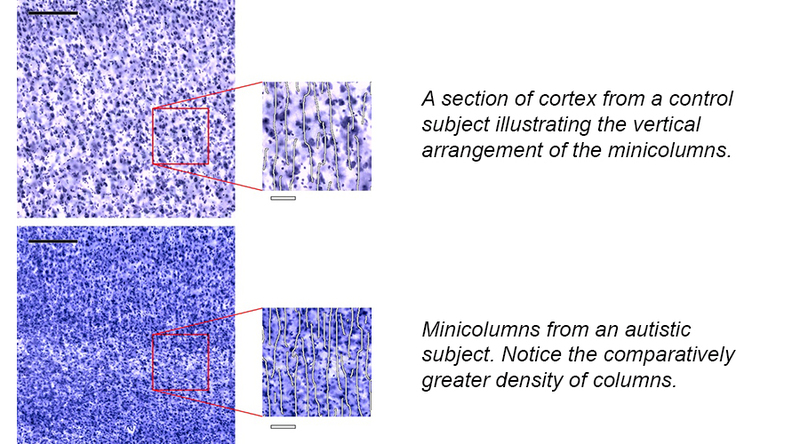 From my fiancé’s earlier work, his team found that the density of minicolumns, which are vertically-aligned columns of excitatory cells within the cortex, is greater in autistics compared to controls. The gyral pattern in autism is also more complex and the gyri relatively smaller. And finally, a significant number of autistics upon postmortem study show evidence of cortical, subcortical, and white matter heterotopias and dysplasias, both of which are evidence of abnormally-timed cell divisions and disturbed migrations. In the case of autism, it seems that progenitor cells continue to divide for a longer period of time than usual, creating more minicolumns and sometimes malformed tissues. How could this be related to effects from a Metabolic Syndrome? The hormonal profile of women with this kind of syndrome tends to include unusually low levels of the hormone, progesterone, and higher-than-normal levels of testosterone and estrogen. This tends to lead to problems with menstruation and oocyte (egg) formation, which can sometimes lead to the development of cysts (PCOS) because the egg is not released into the fallopian tube. When a woman with this syndrome does become pregnant, her abnormal hormone levels are shared with the developing embryo/fetus because hormones can indeed cross the placental barrier. Simon Baron-Cohen believes that excessive testosterone over-masculinizes the brains of autistics, leading to the symptomotology. However, I suspect that, as occurs with normal males as well, estrogen may be playing a larger role when it comes to neocortical development in autism. In fact, at this early age it’s estrogen that masculinizes many parts of the typical male brain, promoting gender dimorphism. Testosterone does seem to have an easier time crossing the blood-brain barrier; however, it can also be aromatized (changed over) into estrogen once in the brain, and the embryonic and fetal brains have a LOT of aromatase available. By gestational week 9 in humans, the estrogen receptor-alpha (ERa) is expressed in the proliferating zones and the developing cortical plate; by 15 weeks ER-beta is also expressed in the proliferating zones, and by 16/17 weeks it’s expressed within the developing cortical plate . Although the effects are different prenatally than in adulthood, in the embryo/fetus activation of the estrogen-receptors appears to promote proliferation in neural progenitors and when it’s withheld such as through receptor knockout animal models it causes a reduction in the size of the cortex [3, 4]. Interestingly, other animal models have also suggested that ER-beta also plays an important role in the proliferation of GABAergic interneurons which provide the inhibitory mediation for the excitatory pyramidal neurons . If you’ll recall that earlier postmortem work on autistic subjects suggested that these cases show evidence of increased proliferation stemming from the prenatal period, evidenced by greater density of minicolumns, changes to the gyral pattern of the brain, and frequent occurrences of heterotopias and dysplasias. If women with Metabolic Syndromes tend to produce higher levels of estrogen and testosterone, the latter which can be aromatized into the former, then this type of endocrine disruption if transferred to the embryo/fetus may promote increased levels of neural proliferation in the offspring, thus increasing the risk of autism. One thing which is most concerning regarding conditions like PCOS and autism is that some early research is suggesting links between PCOS and the presence of exogenous endocrine disruptors like the xenoestrogen, bisphenol A (BPA) . It also raises the question whether other synthetic endocrine disruptors may not only increase the risks for hormonally-related disorders but the development of autism and related conditions in the children of women affected. For anyone interested in reading more about synthetic estrogens, find my previous blog, The Case of the Promiscuous Estrogen Receptor. ← Are Changes in the Epigenome Actually due to the Dynamic Nature of DNA? Excellent article. I have personal experience. My wife has diabetes type 2. Our daughter was diagnosed with PDD/NOS but recovered. She also was diagnosed with PCOS last year at 28. She was also exposed to a drug contraindicated for delivery six hours before delivery and had birth asphyxia. Interestingly my wife’s sister was diagnosed with gestational diabetes and her son is currently diagnosed with Asperger Syndrome…. Yes, not saying that this sort of Metabolic Syndrome would be related to all cases of autism spectrum conditions, but the evidence is certainly suggestive that it may be etiologically related to a portion of cases. I myself have an AS dx as well as insulin resistance and PCOS. By the way, sorry for not getting around to your syndromic article yet. I still have it and intend on reading it. I’ve just been swamped by life. But I don’t want you to think I’ve forgotten or ignored it. It’s on my very long To Do list. It looks as if lots of the players in the metabolic syndrome arena are characterized by increased inflammatory biomarkers. This has relatively profound implications for the incidence question. Speaking more specifically toward a condition of altered neuron migration and development, several of the immune molecules also appear to be participants in neural proliferation and organization. Definitely agreed re the inflammation issues, as they seem to go hand-in-hand with aspects of this metabolic syndrome. And you raise a good point about various cytokines acting like growth factors in the ventricular and subventricular zones. I definitely think that cytokine-promoted growth could be paired with endocrine-promoted growth. I think both are entirely possible. Both conditions are clearly marked as collateral damage arising from infant and child pharmaceutical interventions.. Clear as day. factor that affects many genes. But this is beyond my expertise — perhaps it’s within yours? I’m vaguely familiar with some of the literature you’re talking about. I could certainly see pregnancy effects outlining a phenotypic course for the offspring, of which may be relevant for autism risk, definitely.